At the Pervasive Computing Group at Alpen-Adria Universitaet Klagenfurt we have a strong research background on distributed smart camera systems and visual sensor networks (VSNs). Over the past years we developed special interest in privacy and security aspects of VSNs. 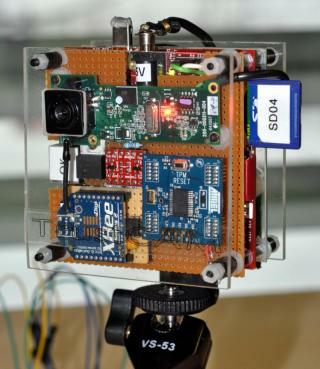 As part of our research we designed and implemented a prototype of a trustworthy camera system called TrustCAM (cp. picture on the right). The knowledge gained from this preliminary work serves as the basis for the TrustEYE project. For reference purposes we subsequently list relevant preliminary publications. T. Winkler and B. Rinner, User Centric Privacy Awareness in Video Surveillance, Multimedia Systems Journal, vol. 18, no. 2, pp. 99–121, 2012. T. Winkler and B. Rinner, Securing Embedded Smart Cameras with Trusted Computing, EURASIP Journal on Wireless Communications and Networking, vol. 2011, p. 20, 2011. T. Winkler, Vertrauenswürdige Videoüberwachung, Datenschutz und Datensicherheit, vol. 35, no. 10, pp. 797–801, 2011. T. Winkler and B. Rinner, User-Based Attestation for Trustworthy Visual Sensor Networks, in Proceedings of the International Conference on Sensor Networks, Ubiquitous, and Trustworthy Computing, 2010, p. 8. T. Winkler and B. Rinner, A Systematic Approach Towards User-Centric Privacy and Security for Smart Camera Networks, in Proceedings of the International Conference on Distributed Smart Cameras, 2010, p. 8. T. Winkler and B. Rinner, TrustCAM: Security and Privacy-Protection for an Embedded Smart Camera based on Trusted Computing, in Proceedings of the International Conference on Advanced Video and Signal-Based Surveillance, 2010, pp. 593–600. T. Winkler and B. Rinner, Applications of Trusted Computing in Pervasive Smart Camera Networks, in Proceedings of the Workshop on Embedded System Security, 2009, p. 10. Disclaimer: Most of the publications on this page are copyright protected. The papers published on this site represent the authors' versions of the work and are not intended for redistribution.